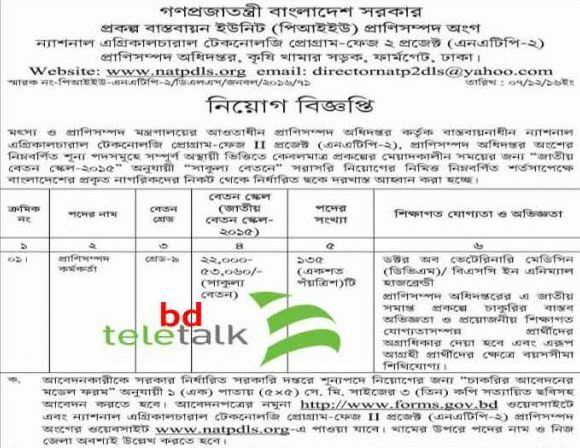 Bangladesh Department of Livestock Services have published a job circular recently. In the job circular, the organization has offered job for the post of Livestock Extension Officer. Every year, the Livestock Services department offers a number of job for different categories and the number of interested personnel for the job is huge. The Livestock Extension Officer Job circular was actually published on December 8, this year. Get Department of Livestock Services Extension Officer Job Circular 2016. More details related to Livestock Extension Officer has been updated in the later part of the news for the sake of our readers so that they can find much needed information. This is basically a full time job offered by government. Both male and female can apply for the job as mentioned in Livestock Extension Officer Job circular. Job location can be set to anywhere in Bangladesh. Candidates with not more than 30 years age will be eligible to apply while the candidates from freedom fighter’s background will enjoy 32 year age limit for this job. Needed Qualification: Applicant must have Doctor of Veterinary Medicine degree or BSC in Animal Husbandry. Experienced candidates will have extra benefits in terms of recruitment. After preparing the application the candidate will have to send it to the office of the relative field and post and zilla name should be mentioned on the envelope. Each and every applicants will have to provide have to provide needed documents while attending in the viva for Livestock Extension Officer Job. No TA/DA will be provided during the written and viva exam of this process. To get more information regarding Livestock Extension Officer Job and many other government jobs, do not forget to visit our site.